Each week on Football FanCast we will be celebrating those special breed who lit up the Premier League with their unique brand of utter genius. This time out we pay homage to a prince from the peninsula who lived up to typecasting. 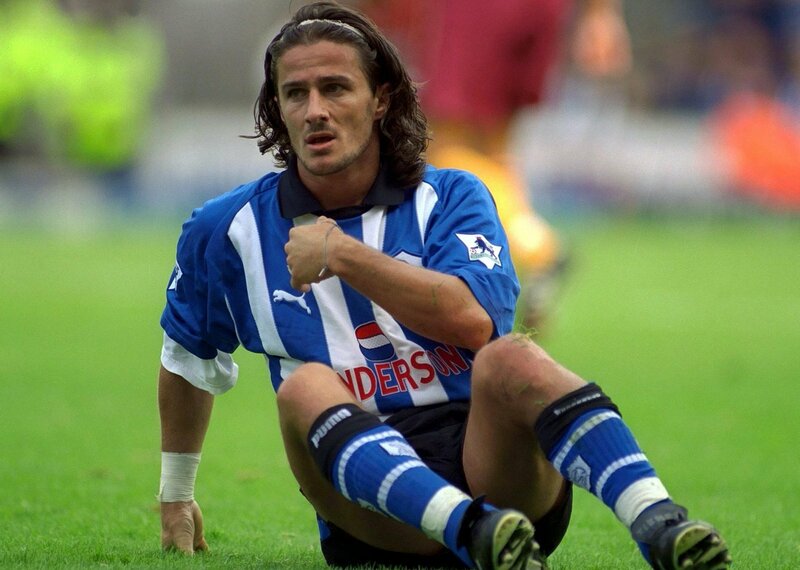 When Benito Carbone arrived in Sheffield in October of 1996 for a sizable fee of £3m one of his first tasks was to stand on the Hillsborough pitch, decked in his new club shirt and pretend to eat a plate of spaghetti. A year later he was asked to repeat the stunt only this time he was joined by compatriot Paolo Di Canio – freshly down from Celtic – and now it was pizza as the stereotype of choice. Both strikers gamely gurned for the cameras, holding up twelve inches of clearly uncooked margherita. Ladies and gentlemen, welcome to the 1990s. With the fledgling Premier League still British-heavy with talent it was an era when the signing of a Serie A star was still accompanied by semi-ignorant fascination and in truth the 25-year-old hardly helped to break down entrenched typecasting. He played with a floaty, swishy-shooshy style on legs too skinny to belong to a professional athlete. His mop of curtained hair – that brought to mind an indie kid unable to accept the march of Britpop – was often held in place by an alice-band during matches. He was consistently inconsistent but capable of exotic brilliance. And he fell out with his team-mates a lot, later blaming the division on his tee-total ethics in comparison to the hard-drinking Yorkshire stock around him. “At the beginning, it wasn’t easy, the culture was very different and I made the mistake to behave as an Italian in England,” he told Planet Football last year. So here was an Italian who played like we believed Italians played, looked like we believed Italians looked, and acted like we believed Italians acted. And by God we loved him for it. Carbone left Inter Milan because Roy Hodgson insisted on stationing him out wide on the left and besides the Nerazzurri were clearing the decks to bring in the original and best Ronaldo. Prior to occasionally lighting up the San Siro he had succeeded Gianfranco Zola as Napoli’s number ten who in turn had succeeded Maradona. Prior to that he’d been a delicate bull at Torino. It didn’t take long for the Hillsborough faithful to take to their new prodigy and delight in his quick feet, sharp slide-rule passes, and a right foot so blessed it rendered the other one pointless. Yet his first campaign in England was tough for the small forward with Wednesday drawing nearly half of their games and this after a summer of serious investment. A final tally of six league goals was just about acceptable given his sharp acclimatisation. Things improved notably the following year as the Owls upgraded Andy Booth with Di Canio and Carbone relished the clever inter-play up front but alas the team was now really struggling and first David Pleat went then Peter Shreeves got short shrift before Ron Atkinson came in hoping to replicate his magic from his previous spell. That magic didn’t materialise and Wednesday finished a disappointing 16th. By the following summer it all went south for the brittle boy from Calabria and not even the boiled sweets Atkinson would give him for training well helped. His relationship with his team-mates had deteriorated to the extent where David Hirst thought nothing of grabbing him by the throat in front of a full stadium after another act of petulance and with his third campaign about to begin Carbone went on strike for close to a fortnight. He returned with his head shaved to denote both his mood and alienation from the Wednesday set-up. 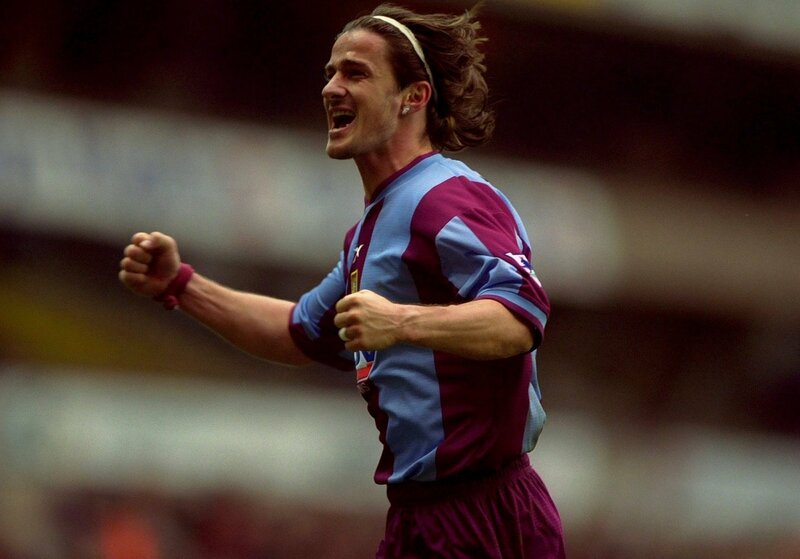 A move then was inevitable, first to Aston Villa and then Bradford with short loan stints at Derby and Middlesbrough ending a largely productive, always enthralling, but ultimately frustrating tenure in England. It was a stay that saw him play for three relegated sides in a row but among that strife were moments of pure individual Champions League. 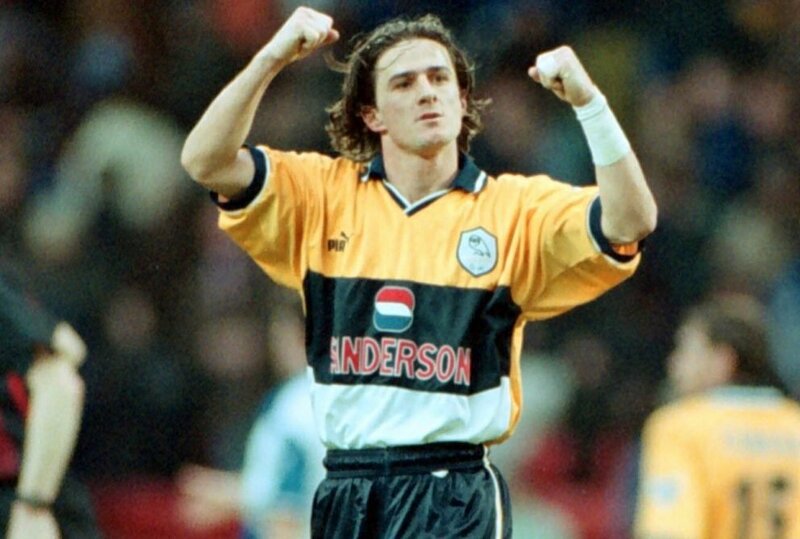 It is the opening day of the 1997/98 season and Wednesday are away to Newcastle. Just eight minutes in the visitors already find themselves a goal down due to an early strike by Tino Asprilla but they’ve settled well and recovered from the set-back. Peter Atherton dinks a speculative long ball into the Newcastle box from distance and it falls short of the huddle of four players in there. Only Carbone correctly anticipates the short-fall and steps out to receive it. The ball is cushioned on his chest with a control you or I would brag about later if enacted on a Sunday field. The situation is still far from ideal though: the striker has his back to goal and between him and the target are two Newcastle defenders. In a micro-second, on instinct alone, he flicks out his faithful right boot and knocks the ball to head-height, whereupon Carbone performs the most delicious bicycle kick you’ll ever witness. He watches from the ground as it sails in then races away in triumph. His hair flaps behind him stylishly. He looks so cool in Wednesday’s orange away kit. He is so very, very Italian.